Are you a social media marketer and you need to improve the quality of your copy for social media posts?Obviously you have need some writing tools help, which make more easier for you and your team will published Post in social media without errors. 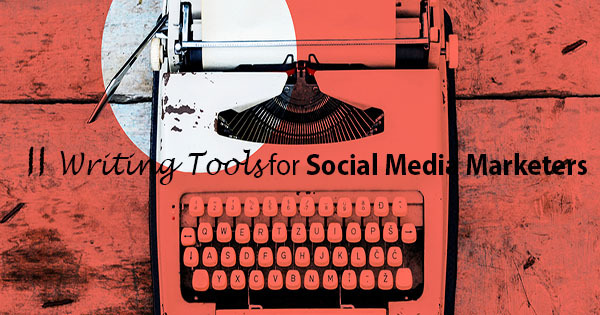 In this article you’ll find 11 writing tools which is very obligate for social media marketers. If you want to check your social content and also analysis then slick write tool helps you as companionable.Slick Write explore writing and check grammar errors,punctuation errors,spelling,potential stylistic mistakes and it have also many features.It also helps you Indicate the mistakes of your writing style. If you need to oftentimes Tweet more than 140 Characters on Twitter,then WriteRack is the best way to Tweetstorm.It is free to use.WriteRack will automatically divide, number, and deliver shorter ones to your tweetstream. You can use it for spelling error,grammar suggestion or style suggestion.Yes i say about the tools polish my writing(also known as After the Deadline).It is a user friendly website .Just paste your text into the web page and have it checked for spelling, grammar, and style. When you works in social media you will find huge active competitor.And obviously you want to make your brand unique.So before you publish all your post it just run by the Help.PlagTracker website and avoid plagiarism. Who likes lot of writing Ulysses app perfect for him.It will organize your all writing in one place.If you maintain many social media account this app saves your lot of time,for organize your content ever.The app costs different for several countries. Writers have need to know how many word he writes so these site have solutions for him.in the other hand when you make tweet you have need 140 character so this website helps you for make your character limit. Imagine you write frequently and a tools or app scan your content for every sentence that are tangled or wordy.It will likewise discover examples of excessive adverb use so you can change those areas. Practically as you would expect, Spellchecker is a site that will rapidly and precisely check your written work for spelling. It’s help you find proofreaders,writers and editors.This site specially made for authors who want publish books easily.It can also help anyone who can writing as an aspect of their job. Need Professional copy-editing and proofreading service wordy amazing works for you.Wordy is real-time editing service.You simply send your social substance to the site and they’ll it with the correct editor. This is hard part when maintain own content editing.Social media have need many content for active in and also social media marketing campaign.I think those tools help you for charm and easier for your social media marketing career.